In DAREDEVIL #375, Karen Page has been framed for murder by Mr. Fear. The Larry Cranston one, has there have been a few Mr. Fears. Cranston wants Murdock to lose faith in the justice system. 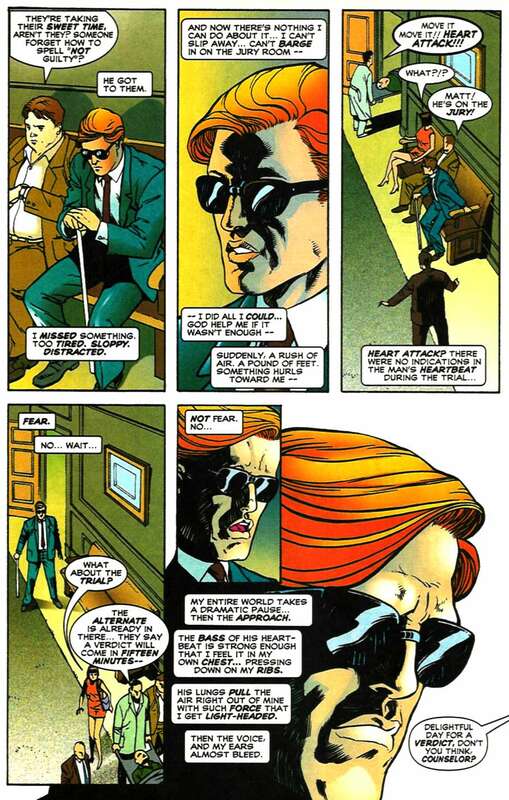 Even though Daredevil finds clear evidence of Fear's frame job, the case is going to the jury. Damn. That's pretty intense. Thanks for sharing this! 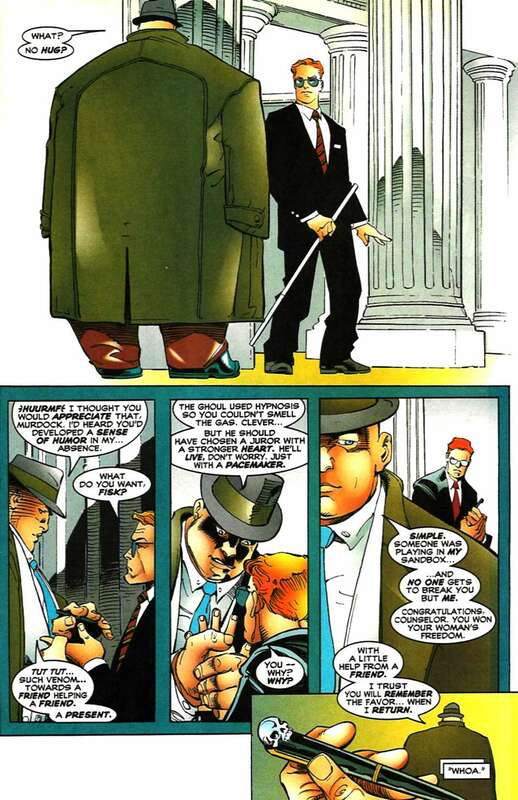 If this is any kind of representative sample, I'm amazed Fisk/Murdock isn't a more popular ship. If I had to guess it's a combination of DD's general obscurity and Fisk being a large fat guy. There's not a lot fandom stuff for Fisk period. I did spot some Vanessa/Wilson stuff after the Netflix show though. Large fat middle-aged muscular sugar daddy guy. So bara. Much seme. Wow. I'd say part of it is because so much of Fisk's characterization is using others as tools, and how Matt is consistently surprised whenever Fisk does *anything* good. For all that it's personal, it's got a very different vibe than Clark/Lex or Batman/Joker. Also, both Bats and Clark try to redeem their villains. Matt... not so much. Why pair Matt with Wilson when you can pair him with Bullseye? "I never miss... so why do I miss him?!" 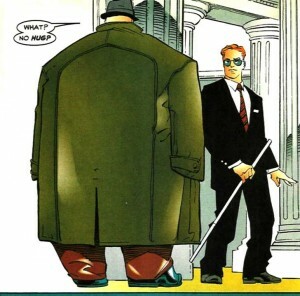 Shame Fisk's knowledge of Matt's identity is kaput, I always enjoyed their relationship.